It is difficult to be a parent today. Child rearing is quite challenging and proves to be more difficult as kids become older. Kids tend to be increasingly curious and explorative. Outdoor play allows more intereaction with people, animals and other things, exposing them to possible sicknesses. And while children need to feel secure and protected, and it is our job as parents to create a nurturing environment where they can thrive. NIDO®3+ helps by finding a balance. With NIDO®3+’s protection of Lactobacillus PROTECTUS®, Prebio 3, and other essential nutrients, first-time moms can let their kids be kids. The world of parenting can definitely be magical with NIDO®3+. Enabling kids to explore and experience the world to help them to grow into the best they can possibly be can now be worry-free. 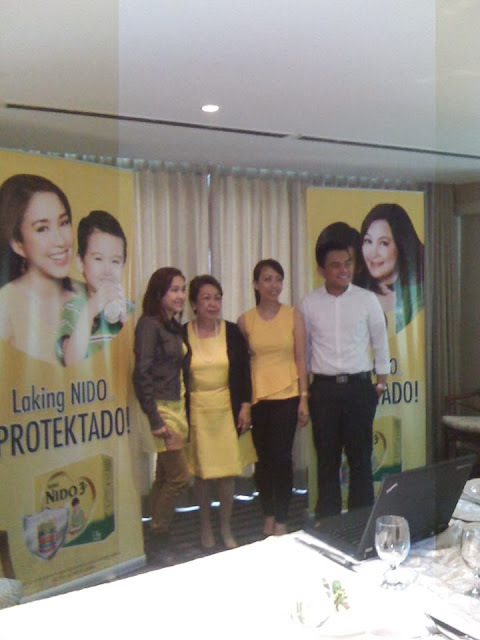 Yesterday, NIDO 3+ held a press event for the 2014 campaign of NIDO 3+ at Chef Jessie in Rockwell Center. New NIDO 3+ brand ambassador Barbie Almalbis-Honasan attended the event to represent the younger generation of moms. She shared parenting experiences while Dr. Lilian Leynes-Juadiong, child expert and Associate Professor at the Family Life and Child Development Department of the College of Home Economics of UP Diliman, gave expert insights on the different factors first-time moms worry about, including what can help moms in building their child’s body defenses while allowing them to explore the world on their own. “Mothers are very keen on what they give their kids and they mainly worry about three things during the growing up years. First is if they are getting real value for their money. Second is the acceptability of these purchases, which may be food or drinks, to their kids. Does it appeal to their kid’s palate? Is this something that their kids can appreciate daily? Does it protect them as they explore new things? And, third, is ease of preparation which is something first-time, and often working moms consider,” shared Dr. Juadiong during the media event. During the event, the attendees also had an exclusive screening of the refreshed version of the well-loved NIDO 3+ “You’re My Number One” music video. Barbie closely worked with fellow NIDO 3+ brand ambassador Sharon Cuneta who last revived the song back in 2009. “It was an honor to work alongside Sharon and her son, Miguel, for this project. I am equally thrilled that I got to do this with both Stina and Liam who also enjoy NIDO 3+ very much,” said Barbie. In addition, Nestlé Philippines gave a sneak-peek on the various initiatives of NIDO 3+ for this year, maximizing online platforms to reach and support first-time moms. According to a study on digital behaviour among women, mothers go online to gather relevant information and reach out for opinions. NIDO 3+ responds to this need of first-time moms in a creative way by optimizing social media. Watch out for is the “You’re My Number One” Sing-Along Tab on the NIDO 3+ Facebook and get to sing along NIDO 3+ song’s fresh new beat with Barbie. Make this activity a regular fostering bond between your child and you. Other exciting apps include a digital meter which gauges what worries mothers during the kid’s growing up years and a special promotion for moms and their little ones to capture the protection and enjoyment kids experience with NIDO 3+. Moms can look forward to using the said apps effective February 2014 at www.facebook.com/nidofortified.ph.